Revisiting Sweeney Todd on DVD, I’ve come to the undeniable conclusion that Johnny Depp is one of the best actors living today. He can slip into any role it seems, be it a crazy pirate, a man with scissors for hands, a very strange chocolate maker, or a biographic role like in “Ed Wood.” With Sweeney, he proves he can do just about anything. A singing demon barber is a stretch, but he delivers the best performance of his career in the role. I’ve also come to the conclusion that Tim Burton is one of my favorite directors. Sweeney Todd is his masterpiece; he’s taken a very theatrical musical and turned it into a phenomenal film. Every frame of this movie shows his influence; no other director could have done this. I’m still really angry that he didn’t even get a nomination for Best Director this year. Anyway, when Depp and Burton team up, it seems like there is no limit to what the pair can accomplish. Depp is Benjamin Barker, the barber whose wife and child were taken from him by the villainous Judge Turpin (Alan Rickman, also giving a phenomenal performance). After fifteen years in exile, Barker has returned to London as Sweeney Todd, and the only thing on his mind is revenge. Aided by the owner of a shop that sells “the worst pies in London,” Mrs. Lovett, Sweeney’s anger and madness overtake him, and in his vengeance, he soon draws all of society within the reach of his blade. Based on Steven Sondheim’s groundbreaking musical, the movie’s greatest achievement might be in the adaptation. Burton has taken a three hour stage production and whittled it down to a very fine 116 minutes. Yes, many songs have been cut, and others have been reworked. But it all serves Burton’s goal---to make a musical that feels like a movie. He succeeds extremely well in this regard. Unlike other movie musicals, this does not feel like someone pointed a camera at a stage and filmed a performance. Watching Burton’s film, you wonder how they ever did the musical on stage. The film is very visual, which gives it that “film” feel. The buildings and costumes are all in a very gothic art style, which adds additional layers to the meaning of the story. CGI is used for background buildings; I am not a fan of CGI in live-action movies, but it works surprisingly well here, and helps the look of the film. But of course, the music and visuals would be nothing without the excellent cast and crew. As stated above, Johnny Depp is phenomenal. I love Jack Sparrow as much as the next filmgoer, but for my dollar, Todd is Depp’s deepest, most powerful, and best performance to date. Saying it is a tour de force portrayal of this classic anti-hero is an understatement. He gives Sweeney his all, and we are thoroughly and disturbingly nested in the man’s psyche long before the movie is over. This translates into his singing as well. I never would have thought Depp to be a great singer, but every song he belts out is powerful and moving. He’s not on the same caliber singing-wise as the actors who have portrayed the character on stage, but all of the acting he put into the character’s expressions, mannerisms and dialogue translate fully into his singing, which makes all of his numbers deep and emotional. Alan Rickman is simply evil as Judge Turpin. Has Rickman ever not given a brilliant performance? I doubt it. He can sing too, as surprising as it sounds. In fact, he and Sweeney give the film’s best duet with “Pretty Women.” Sacha Baron Cohen (Borat) has a brief but hilarious role as Signor Adolfo Pirelli, Sweeney’s rival barber. Once again, here’s an actor with no previous history of singing that sounds professional. All the actors sung their own parts, and it ends up being quite surprising. There’s not one weak link in this stellar cast, and without them, the film would be nothing. Blood soaked and grimy though it may be, Sweeney Todd displays many of the negative ideas we, as humans, have raging within us, and as such was one of the most human films of 2007. As I explained above, the movie is highly visual. Burton makes great use of (dark) colors and contrast, along with a decidedly gothic set design, to create the world of Sweeney. The movie was filmed to be dark and grim looking, almost unsettling at times. It is a complex image, and I thought DVD would have a hard time recreating the 35mm print. I am wonderfully happy to report that this disc not only faithfully recreates the theatrical experience of the image, but takes it to amazing new heights. From the opening shot, colors simply jump off the screen; they are vivid and crystal clear. The colors in this movie are almost entirely dark or in shades of grey, but every one of them is distinct and is a joy to behold. Contrast is brilliant, which plays no small part in bringing the dark color scheme to life. Every black is rock solid and incredibly deep. The color contrast scheme is exquisite. Keep in mind, this movie still is not bright or what one would describe as “colorful,” but it perfectly recreates what the film is supposed to look like. The detail is where this image truly excels. Every strand of hair, every crack in the cobblestone street, every plank of wood and all the little marks and designs on Sweeney’s razor are all unbelievably sharp and easy to see. You can make out every little bit of detail on every object. Facial features are a great example, but it’s the background that exhibits it best. Just look at the walls on the buildings or the decaying street; every last crack, spot, and bump is there to see. There isn’t a bit of fuzziness, even in far-away shots. The image on this DVD looks nothing short of hi-definition. 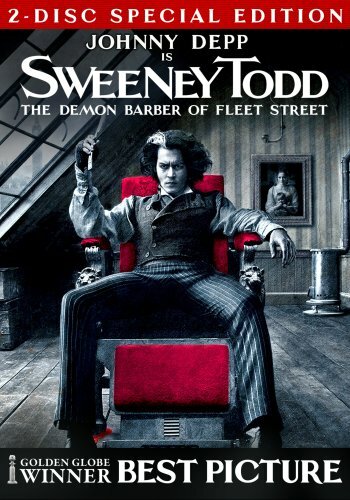 In fact, I’ve seen a few HD-DVD’s that don’t hold up to Sweeney Todd in standard definition. The combination of an incredibly well-rendered color/contrast scheme, and detail as sharp as Sweeney’s razor will fool anyone into thinking they are watching hi-definition. Since Paramount cancelled the HD-DVD release (after the discontinuation of the format) of this movie, they rewarded us with an image that is just as good. This is, quite possibly, the best live-action DVD image I have EVER seen. When you want to show off your home theater, this is the disc to use. As a musical, the A/V experience only succeeds if the audio is good. And the audio is simply great. I’ve listened to the film’s CD soundtrack dozens of times, and the audio on this DVD is much more crisp and vivid. In duets, you can easily pick out what both characters are singing, and each instrument in the orchestra is easy to hear. My only complaint about the audio is that sometimes the background music overpowers the dialogue, which is set at a lower volume than the singing. This is a small quibble; it rarely happens. With the phenomenal video and the exceptional audio, this is an absolutely top-notch viewing experience. The sole bonus feature on Disc One is the featurette Burton + Depp + Carter =Todd. Running at 26 minutes, the featurette basically describes the casting of the film and how the actors prepared for and preformed their roles. There’s also some brief discussion at the beginning about how the project came to be. This is a nice featurette, but really only scrapes the surface. Luckily, the DVD producers have crafted a second disc loaded with as many extras as there is meat in Mrs. Lovett’s human-pies. And all of it is very delicious. Things start with the 20-minute Sweeney Todd Press Conference. Filmed in November 2007, it features Tim Burton, Johnny Depp, Helena Bonham Carter, and other cast members being asked questions by the press. They give only a few serious answers, and there a lot of laugh out loud moments. It really illustrates why this film worked—the cast and crew enjoyed each others company. When they do get serious, it’s all the more rewarding. One of the most interesting features is the 20-minute Sweeney is Alive—The Real History of the Demon Barber. This is a historical piece, tracing the origins of the character to 17th century myths, and the real life inspirations. Historians fill in the details for us, while cast and crew chime in to tell us how it affected the film. This is a really cool, informative feature. Next up is the 12-minute Musical Mayhem: Sondheim’s Sweeney Todd. Steven Sondheim is on center stage here, explaining the origins of his musical. He and the film’s musicians also discuss how it was adapted for the medium of film, and Sondheim tells us how he actually loves most of the cuts and changes. Very cool, if a bit short. Then there’s another historical piece, the 16-minute Sweeney’s London. We learn about the times the film is set in, with historical photos and historians telling interesting tidbits. Proving that these featurettes are arranged in no particular order, the next bonus is the 24-minute The Making of Sweeney Todd. This is in the vein of the featurette on disc one, and the first ten minutes are a bit repetitive of footage found in that feature. But it expands upon minor cast parts, and we learn about other aspects of the production, like the award winning costume design. It’s definitely worth a watch. Next is Grand Guignol: A Theatrical Tradition. Running 19 minutes, this another historical feature, and less related to the film than the others. It’s all about a French theater where macabre, scary plays were performed, including the first stage version of the legend of Todd. Designs For a Demon Barber runs 9 minutes and discusses the costumes, sets, and make-up of the film. There’s some great on-set footage here. A Bloody Business is bloody cool. Running 9 minutes, it describes how the blood effects were achieved in the film—complete with a full demonstration of how the throat slicing was achieved. Watching the special effects guys experiment with blood effects is hilarious to see—once you get over the gag reflex. Rounding off the featurettes is the 11-minute Moviefone Unscripted with Burton and Depp. It’s basically just the two buddies asking each other questions that fans have sent in; it’s not horribly informative, but you do realize that these two guys are like brothers, which is probably why their collaborations are so good. There’s also an 9 minute set of production photos, set to music from the film. Entitled The Razor’s Refrain, it is completely superfluous; but I’m sure someone will enjoy it. There’s a navigational Photo Gallery as well, which contains tons of storyboards, pre-viz art, sketches, etc. The final bonus is the Theatrical Trailer. This is a truly remarkable set of extras. The total running time of all the video bonus features is just five minutes shy of three hours—and every second is worth your time. There’s something here for everyone; those who want to know about the making of the film, those who want to know about the history of the story, and those who enjoy trailers. I’m not the biggest fan of history bonus features—they’re usually a cheap way to stop DVD producers from doing real work. But the 3 historical features here serve to bring greater depth to the film; in fact, everything on both discs really deepens ones understanding of the movie, and that’s what bonus features are about. And all of them (except for the “Moviefone Unscripted”) are in full anamorphic widescreen, just to add icing to the cake. Warner/Paramount could have dumped this movie on DVD with a bare-bones release and poor A/V quality; this wasn’t a mega-blockbuster or anything. But instead, they deliver the best DVD set of the year so far, including the best live-action DVD image I’ve ever seen. Every aspect of this DVD is top-notch, and is worth every penny of its cost. And at the heart of it all is a very creative, very moving, very human film. This DVD set lives up to the quality of the movie, and I give this DVD my highest possible recommendation.